A lot of guitarists or would be guitarists would like to be able to teach themselves guitar. But can you teach yourself to play guitar? The answer is kind of yes – but you need to define what teaching yourself actually means. How Can We Classify Self-Taught? The true meaning of self-taught is hard to define. I mean if you go and look up a video on you tube or ask a friend to show you something would you constitute that as a “lesson” in a way? 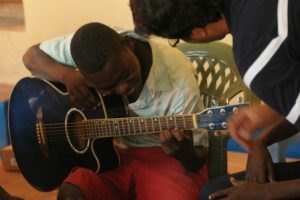 Is truly self-taught someone who only sits down with his/her guitar and discovers how to play out of thin air – or only by listening to songs and learning to play them by ear? Or is self-taught simply any guitarist who learns how to play without the help of structured in-person guitar lessons? So this includes anyone who simply looks up random you tube videos or posts about how to play this song and how to learn that technique – or they learn something new from their friend every time they hang out. These don’t constitute structured, ordered lessons in my opinion. Your friend only shows you things randomly and the online “lessons” you are looking up and are only done so when you can’t figure out how to use a certain technique to play the song that you are teaching yourself – probably through listening to the song and looking up the tableature. So Is It Possible to Teach Yourself Guitar Using this Definition of Self Taught? Absolutely, of course. You can definitely teach yourself guitar this way. And you can probably become a reasonable player, eventually. But is it the best way to learn or even anywhere near close to as good at learning guitar through proper structured lessons? And how long will it take you to figure out everything that you could figure out in lessons designed to keep you progressing? Teaching yourself in this way will inevitably be a very slow way to learn – and it will also likely be far less effective and far more likely that you end up with very poor technique. Using lessons, whether online or in-person will be a far more efficient and a far more effective way of learning than feeling around in the dark and trying to figure it out for yourself. When I say taking lessons can be done either online or in-person you might be wondering what the difference is between “taking online lessons” and just searching for stuff on you tube, in google etc. What I mean by “online lessons” is taking structured, ordered lessons from a website that has developed an effective system for learning and is similar, but not completely the same, as taking in-person lessons from a guitar teacher. 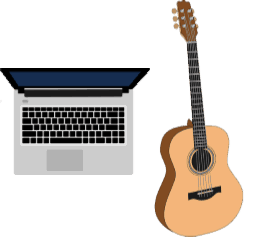 Check out the link below to learn the pros and cons of online lessons and in-person lessons. How Long Should I Take Structured Lessons For? Learning guitar is a lifetime thing so taking lessons could take up decades. But even if you just take proper structured lessons for a year it’s going to make a huge difference to your guitar playing. Your rhythm and technique will be much better than if you were to teach yourself and you will learn a lot more in a shorter period of time. If you want to teach yourself, I highly recommend taking lessons for at least 1 year and then teaching yourself. This way at least what you will teach yourself will be based on a foundation of good technique. Are In-Person or Online Lessons Better? Each has their pros and cons. The main pros for online lessons is that they are considerably cheaper and that you can replay the video lessons as many times as you want. The main pros for in-person lessons are that you get instant feedback from your instructor and that you have extra motivation to practice during the week (assuming you get on with your instructor!). Those are just a couple of the things to weight up when deciding which type of lessons to take. Check out the link below for a full discussion on the pros and cons. Thanks for reading and I hope this post has answered the question whether or not you can teach yourself guitar. The answer is invariably yes, but not well. And of course it depends on how you define self-taught. If you have any opinions on whether or not you can teach yourself guitar and whether you can do it properly please feel free to leave a comment in the comments section below. If you’re thinking of going down the road of online lessons, I have reviewed a few of the most popular ones to give you an idea of what they’re like and their relative quality. Check out the link below to check out those reviews. Even if you think that you don’t have natural talent you can still improve your guitar playing considerably by using lessons. And you will definitely learn how to improve your strum and improve your sense of rhythm too. But most important thing is that you enjoy it of course! I tried to teach myself guitar a long time ago but instead I picked up singing. But anyways, I’m a bit different when it comes to progressing and making improvements in any pursuits. It’s easier for me to teach myself slowly first to get into the habit of practicing each day and see myself progress at my own pace. Then when I became pretty comfortable with my progress and my discipline then I’d seek out for a professional lesson and I’ve been pretty successful this way so far. Everyone’s different but I tend to get overwhelmed when I just jump into a professional lesson as a total beginner. Thanks for your input. Your totally right, everyone is different and what works for someone is different to what works for someone else. And I can definitely see your point. The only issue with doing it that way is that you are potentially teaching yourself bad habits that you then have to go and break once you get the lesson. This isn’t necessarily the best way to learn. But I get that professional lesson can be overwhelming. I think in your case, and I bet there are heaps of others that are similar, that online lessons are the way to go. 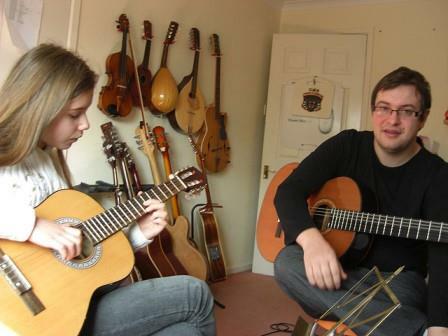 It takes away the overwhelming nature of having to go to a professional lesson – you can just go through at your own pace – but you also get taught proper technique. I’d give that a go if I was you. When I say online lessons I mean a website that has structured lessons (not just randomly looking up stuff on you tube). There are plenty of free and paid options. The paid ones are inevitably better, but the free ones have the advantage of not costing anything! I have an acoustic guitar a and I’m bringing my guitar over to my grandma and grandpa’s house on Friday. Hope you have a great time at your Grandma and Grandpa’s house with your guitar.